The monument is not a gravestone, it is a sculpture that was planned to be viewed from all sides. From every angle is has a somewhat different appearance. On the land which was granted to our ancestors in 1670, in Champigny, our father used to tell us as we passed there, "This is the house where you grandfather Amédée spent his childhood years, …"
Now Robitaille Park in Saint Foy. Tall trees shading the Saint Michel brook and the surrounding property, a stone slab that is in harmony with the landscape. A recreational park. Children playing in the area. The past meets the future… stone walls to climb, slides, jumps…games in space. It must not be a funerary epitaph…But to have inscribed the family coat of arms here, the chevron, pyramid symbol of eternity, Artois joined with Perche, the plough and its blade, the wheat, a dove, from the sea to the brook…A hymn to "Work and Pride", a free movement which is open on all sides…We offer ourselves granite, that proud material, colors, but strict limitations on shapes. Here I am at my drawing board: fill the paper with ideas, move around little models of stones made by hand; soon simple shapes impose themselves on me; a strong base: the land to be cleared, to inhabit, to cultivate; the triangle, the blade; in pink that dominates, a sloping rectangle: "…a house of pieces of wood, one on top of the other, one storey only, floor made of planks, and covered in straw…" the black granite, heavy boulders in the field to be worked. I must balance these shapes, make them equal, move them around: a discovery of polygons playing with fantasy, which stretches toward infinity…Now draw this model as a blueprint, with elevations, for a careful executor, and, on well-laid foundations, a difficult positioning with these heavy blocks, so much attention…and a proper and showy unveiling for Robitailles everywhere. To see there all of this, but as you wish, a car, a belfry…things that the imagination is able to dream. Where did these blocks of granite come from? The pink granite, in the form of a trapezoid, comes from the Lake St. John region, north of Alma. The pale grey, in the form of a triangle, comes from the Eastern Townships. The black, in the shape of a deformed cube, also comes from the Lake St. John region. And the base, greenish in color, was taken from the Rock River (Rivière-à-Pierre) quarry, in Portneuf county. What the monument might signify. and the greenish granite base, is the foundation of the family, the parish, the city, and the country. The monument therefore represents the symbol of the work of some ten generations on this ancestral land. It is moreover an example of generosity on the part of those who produced it. 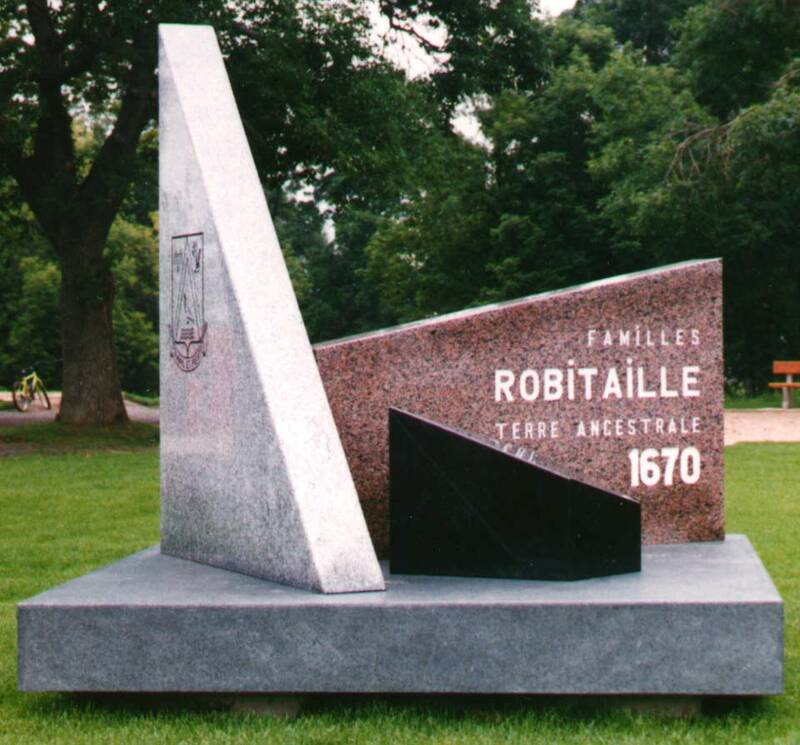 It will therefore promote pride in being a member of the Robitaille family as is expressed so well in our motto: WORK AND PRIDE (TRAVAIL ET FIERTÉ). The monument was erected thanks to our donor and builders who gave, not money, but materials and labor. And for improvements to the park area, the City of Sainte-Foy. We sincerely thank these builders for their generous contributions to the erection of our family monument.